I have a particular passion for this space, I see the innovation coming out of the gaming industry as one of the fastest growing of any sector, fuelled by significant R&D budgets, healthy consumer demand and commercial models as well as a desire and freedom to be innovative and try new things from both an industry and consumer perspective. Gaming is not only fun, but with connectivity and the surgence in multi-player gaming it’s also a way to be part of a community and communicate with friends old and new. Dr Stuart Smith of the Neuroscience research centre chaired today’s workshop. Stuarts interest in games for health started when he was working in a spinal unit, predominantly filled with the results of young male bravado, alcohol and a speeding car, and seeing how these young men were bored with the repetitive tasks of traditional rehab, frustrated by the lack of feedback and not seeing the results of their efforts – hard to see through the skin and see the muscles reforming, Stuart saw a massive opportunity the games could play in meeting some of these barriers to uptake and adherence to rehab, and so the spark was ignited. There is a lot of bad press about games, it’s addictive, drives aggression in young men, makes you fat and lazy and lack of social interaction etc – BUT there are also a lot of positives in particular with movement gaming and social gaming. 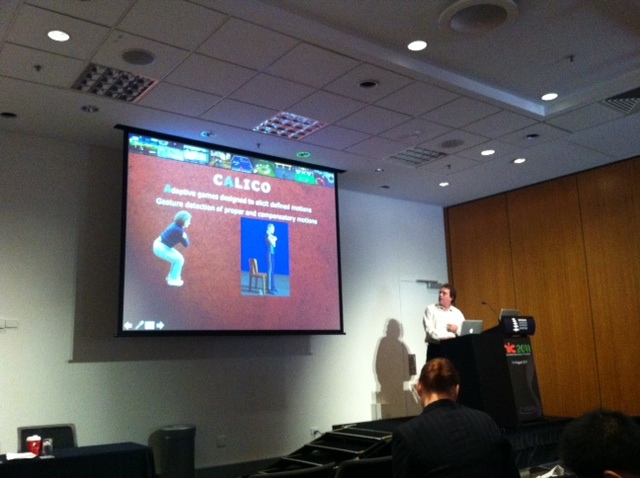 Todays’ workshop asked the participants How do we build a games for health industry in Australia? – how do we bring together game developers and health researchers and enable a strong line of communication so we can work together for mutual success. We were very lucky to have Bob Hone, Red Hill Studies in LA come and share there experiences of creating movement games for parkinsons, with some fantastic results. They were initially approached by clinicians providing therapy for stroke patients and asked can you help us use these new tools to improve patient outcomes? Exercise has been shown to slow and even halt the progression of disease, so can movement through a gaming interface do the same? The games were inspired by clinical needs – the physical therapists says – I want the patient to do X and then the gaming guys build a game around the movement required. It was important to have a modifiable gaming regime – so developers can focus on the hard code – and clinicians can use “builder app” to do minor amendments – e.g move that button 5pixels to the left. Online tracking for clinician oversight and ongoing tuning. The psychology of gaming is important – finding the right balance of not too hard not too easy – so your confidence improves, but failure is Ok too Its good to fail as it drives you to try harder. People feel success and a sense of achievement when they get to a new level. This entry was posted in HIC2011. Bookmark the permalink.